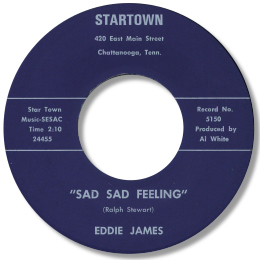 Eddie James probably cam from Tennessee as all his recordings came from the state. His Startown single appeared on a Chattanooga label and is a simple but effective midpaced item which suffers from a low budget production. Both his King 45s from the early 70s are much better. They were cut at the Starday/King studios in Nashville and benefit from the experienced session men there. Reap What You Sow is a fine country slowie featuring subdues strings and some tasteful electric piano but (I Can’t Get Used To) Livin’ Without You is a real gem. A beautifully rendered country soul ballad with some lovely picked and chorded guitar and piano fills. 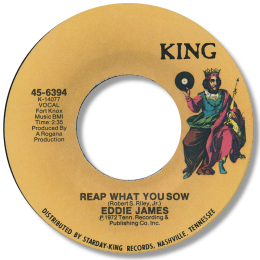 Eddie’s voice is gentle and concerned with just enough “rasp” to make the lyric meaningful. These are real throwback discs at a time when wah wah guitars and funky keyboards were all the rage – no wonder they didn’t sell. But the timeless nature of this sort of music means that it lasts so much better than the transient nature of “today’s sound”.